LONG ISLAND CITY — Two new school buildings — including one with sweeping Manhattan views — opened in Hunters Point Monday morning, where parents have been calling for more classroom seats to accommodate a growing number of young families with children. "This is definitely a must for this neighborhood," said Jocilene Malas, whose third-grader was headed to class at 46-08 5th St., a new building which will house older students from existing elementary school P.S./I.S. 78, which is expanding this year to include a middle school. P.S./I.S. 78 will now be split between the new location and its original space at 4-74 48th Ave., where children from pre-K to second grade will remain. "I was happy there, too, but this is a real school," said mom Anna Di Gregorio, whose daughter Marianna started her first day of fifth grade at the new building, which offers more space and amenities that the original location lacks — including an auditorium, a large gymnasium and a playground. "They can finally have a real recess," Di Gregorio said. "I love it." Meanwhile, another new 1,100-seat facility opened Monday at 1-50 51st Ave., one of the first buildings to be completed in the city's planned Hunters Point South development. The new school building includes 52 full-size classrooms, science labs, science prep rooms, a gymnasium, a library, an auditorium and a cafeteria, according to the Department of Education. 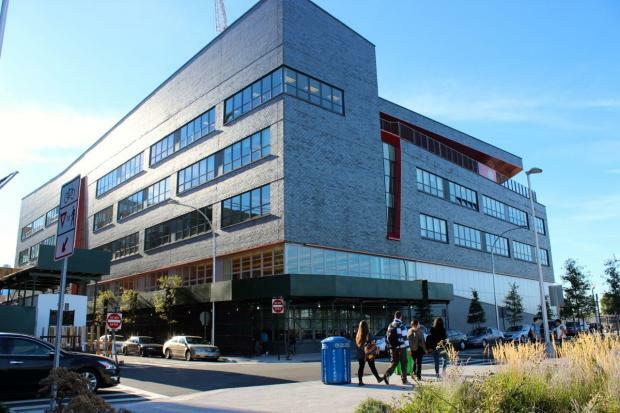 The space will be shared by three separate schools: the Academy for Careers In Television and Film, a high school which is relocating from another building in Long Island City, District 75 program The Riverview School and the new Hunters Point Community Middle School. Astrid Cruz, whose son Bryan started tenth grade Monday at the Academy for Careers In Television and Film, said the new space is an upgrade from the high school's previous site in the basement and first floor of 36-41 28th St., where it had shared the building with middle school I.S. 204. "It's great — it's a brand new building," Cruz said. "It's really high-tech."